Is Saudi Arabia Trying to Drive Wedge Between Russia and Iran? Saudi Visit to Moscow: Driving a Wedge Between Russia and Iran? Since the Russian intervention in Syria and growing Iranian influence in the region, Saudi Arabia has been on the losing end of the geopolitical power play. Last week’s visit by Saudi King to Moscow couldn’t have come at a better time. The historic visit by Saudi King Salman and Crown Prince Mohammed bin Salman to Moscow is a remarkable display illustrating a significant geopolitical shift on the part of the Kingdom’s foreign policy calculations. The visit underscored the necessity for the Kingdom to secure an improvement in relations with the Kremlin, including greater cooperation on shared oil interests. It also highlighted the Al-Saud’s desire to secure large-scale and qualitatively superior defense deals (including technology transfer) compared to Iran such as the S-400 missile defense system which the Saudis said they were interested in purchasing. The Kremlin’s decision to provide such hardware will have to be carefully weighed against, on the one hand, the economic incentive, versus any possible destabilizing effect on the regional balance of power. Moscow also needs to consider the possibility that President Donald J. Trump will roll back U.S. inclusion in the Joint Comprehensive Plan of Action (JCPOA), a 2015 nuclear deal with Iran, which could have a major destabilizing effect of its own as Iran may reconsider its uranium enrichment program. The signs so far indicate that the S-400 deal will proceed. The Arab Uprisings in 2011 and the subsequent conflicts in Syria, Libya, and Yemen where the Saudis have waged a bitter war against the Houthis have also been a cause for alarm. Russian intervention in Syria in direct support of Syrian President Bashar al-Assad stood directly against Saudi regional strategic interests. Therefore, growing economic engagement with the Russians supports Riyadh’s attempts to diversify its international arms suppliers but also adds significant weight and political goodwill behind the Kingdom’s attempts to resolve Syria. With the U.S. and Russia now taking the lead on diplomatic initiatives to end the conflict, such as the southern de-escalation zone, Russia working with Turkey and Iran through the Astana process, and France working on its conference diplomacy, Saudi Arabia and other “stakeholders” in the conflict have largely been excluded. Saudi Arabia is therefore coming around to seeing that a solution on Syria is only feasible through Moscow which controls many of the facts on the ground. Whilst the situation is unlikely to change overnight, since even commitments to establishing small enclaves in Syria have been ineffective in practice, such a policy may give Riyadh more influence and relevance in future negotiations. 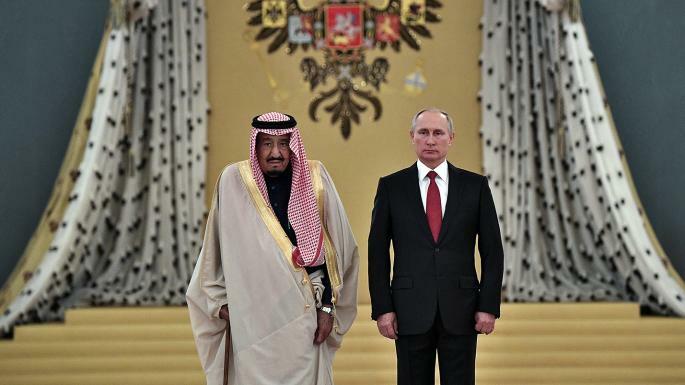 Unsurprisingly then, in tandem with this strategy is Saudi support of Russian President Vladimir Putin’s struggle with terrorism, itself a function of the second Chechen war from 1999 to 2009, including the Moscow theater hostage crisis in 2002 and the Beslan school massacre in 2004. As Riyadh experiences further terror attacks, the most recent being a foiled attack outside the royal palace in Jeddah, that will not be a difficult leap to make. However, what may prove to be more problematic is the ability of Saudi Arabia to shape Russian foreign policy such as getting a seat at the negotiating table to fit its own ends, including deciding on the mechanism that gives the voice back to the Syrian society.